…as well as many, many other things. However, the current operability of smart contracts on the Ethereum network presents some practical limitations. Essentially, the way that the Ethereum blockchain works makes it impossible for smart contracts to interact with resources outside the blockchain. For example, let’s imagine a smart contract was created that would pay a voice actress every time a commercial she recorded was played on the radio. By itself, the smart contract would not be able to interact with a radio station’s stream of data to tell when the commercial was being played; it would have to be added into the blockchain. The same limitations apply when a smart contract was designed to operate with data from banking systems or APIs. This limitation is mitigated using an “oracle”, which, in this case, is not a crystal ball or a set of tarot cards. In the blockchain world, an oracle is a piece of software that acts as a sort of middleman between blockchains and resources (ie data streams) that are located elsewhere. Without an oracle, a smart contract does not have access to the data necessary for it to know when to execute its pre-programmed functions. Because oracles are typically operated by centralized, third-party entities, it is not always possible to know whether the data that an oracle provides is trustworthy or not. Let’s take a second look at the voice actress example–if the data being fed into the smart contract is inaccurate, the actress will be paid an inaccurate amount. The self-executing nature of smart contracts makes it absolutely essential that the data that is being fed into them is correct. To alleviate the risk of smart contract execution based on inaccurate data, some smart contracts use notarization or the manual input of data. However, both of these “solutions” present their own sets of issues, including increased cost and inefficiency in terms of time. For example, if a smart contract is reliant upon real-time stock market data, hiring someone to manually input the data would be extremely impractical. ChainLink will connect smart contracts to legally binding e-signatures and bank payments. One example of this that ChainLink provides on its own website has to do with smart contract-based securities, which would be able to use the network to act in accordance with real-time market data. The securities could also use ChainLink to pay out to their investors were ChainLink to be integrated into an existing banking system. Another use case provided by ChainLink is the integration of the network into the insurance industry. ChainLink could be used to provide Internet-of-Things data surrounding an insurable event, ie “was the warehouses magnetic door locked at the time of a breach? Was the company’s firewall online? Did the flight you had insurance on arrive on time?” Again, ChainLink could be used to conduct the insurance payout through integration into a banking system. ChainLink’s upgradable network is the first oracle aggregate that is itself blockchain-based. It will allow smart contracts to securely access and interact with data located outside of the blockchain, as well as the ability to interact with separate blockchains. ChainLink’s network will exchange LINK tokens for data feeds and APIs that can be hooked directly into smart contracts. The providers of these data feeds and APIs are known on the ChainLink Network as Node Operators; the external resources that the network will link to are called ChainLink Nodes. ChainLink’s network is divided into two parts that interact with one another–on and off the blockchain. The on-chain part of the ChainLink network filters through the oracles according to the metrics that have been requested for use in a smart contract using a services level agreement. The result of the filtration is what is implemented into the smart contract that the query was made for. The off-chain part of the network is made up of ChainLink oracle nodes that have been connected to Ethereum’s network. ChainLink’s goal is to have nodes spread across a variety of industries (ie, stock exchanges, payment systems) so that it can act as an efficient, low-cost, all-in-one network that can fulfill a myriad of different needs. If ChainLink is successful in its appeal for integration across industries, early investors could potentially see a high return. To integrate the ChainLink network, a service provider can connect their chosen API to the network. These providers are incentivized to provide API information with LINK tokens. 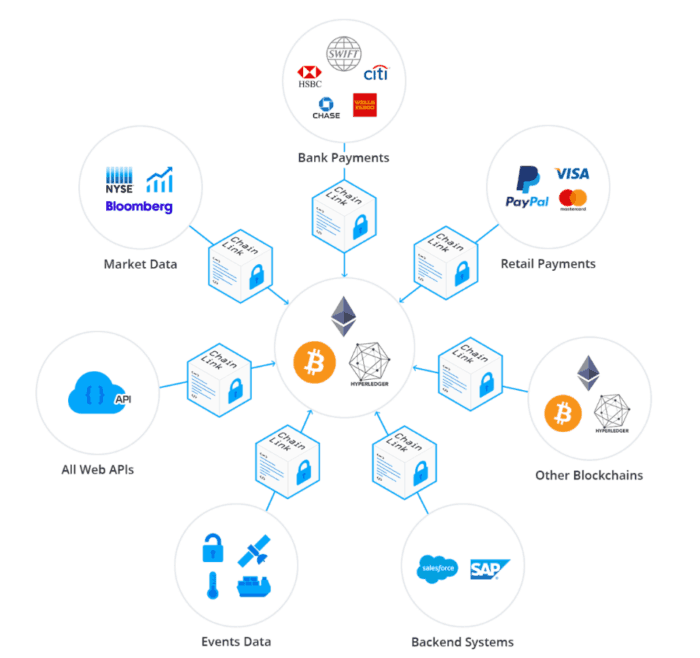 So far, the ChainLink network is compatible with Bitcoin, Ethereum, and Hyperledger. White Chainlink’s development team is quite small, with just two members, co-founders Sergey Nazarov and Steve Ellis, Nazarov, who is the CEO of Chainlink, has made a reputation in the world of cryptocurrency as the founder of SmartContract (2014) and Secure Asset Exchange (2014). Chainlink CEO Steve Ellis previously worked with Nazarov on the Secure Asset Exchange; he was previously employed by Pivotal Labs as a software engineer. A very positive sign for ChainLink’s future is its team of notable advisors. Hudson Jameson of Ethereum Foundation is listed. Also on the team is Ari Juels, Cornell Tech Professor of Computer Science and Director of IC3; Andrew Miller, advisor to Zcash and Tezos, is also a ChainLink advisor. ChainLink has also formed a partnership with SWIFT (the Society for Worldwide Interbank Financial Telecommunicatins), which is also known as the world’s largest system for electronic payments. According to a 2012 Reuters report, the network was being used to exchange over US$6 trillion each day. SWIFT is currently used by more than 11,000 banks located across the globe. This partnership is particularly important as it provides quite a bit of credibility to ChainLink; success with SWIFT could make ChainLink a viable candidate for integration into even more banking systems. Chainlink’s ICO began on September 19 and reached its goal of US$32 million before the four-week allotment had passed. Following the ICO, 350 million of the one billion total LINK tokens were distributed. The key to the success of any coin as a technological tool and an investment is adoption for practical use. As the first blockchain-based oracle network, it seems that ChainLink is well positioned to bring smart contract use further into the mainstream. Navigating the sea of ICOs and altcoins can be intimidating. To receive objective and reliable information about new investment opportunities in the world of cryptocurrency be sure to keep an eye out for the latest updates in our ICO section. What are your thoughts on ChainLink? Leave a comment below–we’d love to hear from you.